Summer in Boulder is all about outdoor activities like climbing, hiking, swimming, and biking. It’s what we love about the town, isn’t it? Unfortunately, with these outdoor activities comes some risk for injury. In fact, we’re seeing more patients coming in with chipped, broken, or even knocked-out teeth from outdoor sports, especially after a bike crash. With a few simple tips and precautions, we can help you recover from a tooth injury and be back outdoors in no time. It’s surprisingly easy to get a tooth knocked out while playing any sport. If this happens to you or someone you’re with, the keys are to be gentle and fast. The tooth and gap in the mouth should be treated very carefully. There has been damage to the nerve, blood vessels, and supporting tissues in the mouth from a tooth being knocked out. With a wet cloth or paper towel, try to stop any bleeding in the mouth by holding firm, but gentle, pressure to the area. Find the tooth that’s been knocked out and take great care with it. A knocked out tooth is fragile and should be handled delicately to help it survive. Don’t touch the root of the tooth just hold it by the crown or upper part. Rinse it lightly with water but don’t wipe it with a cloth or fabric. Keep the tooth moist. Ideally, you can try and slip the tooth back into the socket making sure it’s the right way around and is straight. If this isn’t possible, put the tooth in your mouth between gum and cheek. If these options aren’t doable, place it in a cup, preferably with saliva or in water or milk. Now it’s time for speed. To improve the chance of saving the tooth, get the tooth and the patient to the dentist as soon as possible, preferably within an hour of the accident. Upon examination of the injury site and the state of the tooth, the dentist can decide how best to proceed. Often a root canal is needed to help the tooth reestablish itself successfully into the mouth. Most dental injuries from bike crashes are chipped teeth, but you can definitely knock a tooth loose if you crash your bike. Either way, it’s possible to save the tooth with a few fast actions on your part! If you chip a tooth, try and find the broken piece. We have ways that we can help repair the broken tooth with the original piece and can try a save the whole tooth. Be careful with the broken piece as even the chipped part of the tooth is fragile. Because it will probably be small, put it in a cup or water bottle to keep it moist. If you can’t find the chipped piece, don’t worry too much – there are ways your dentist can rebuild or crown a chipped tooth. If you knock a tooth loose, gently push it back into the socket. Apply firm pressure and don’t keep wiggling it as this could damage the root or nerves and tissues even further. The final fast action is to get to your dentist! Only your dentist can determine the extent of the damage and start the process of working to repair or save your tooth. 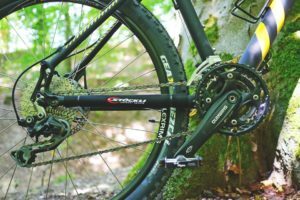 Almost any bike crash, whether road or mountain biking, can affect the mouth and face. We frequently see patients who have lost control and gone over the handlebars resulting in a dental injury, often to the front teeth. There are ways to prevent dental injuries while still getting out there to enjoy the bike paths and mountain trails! A helmet is a must for bike riding because of the high speeds possible and the potential impact of a crash. Get a helmet you like, that is well fitted, and that is appropriate for road or mountain riding. You’ll feel great wearing something that fits well and is protecting you! Mouth guards are another way to stay safe and avoid injury to the teeth, tongue, and lips. 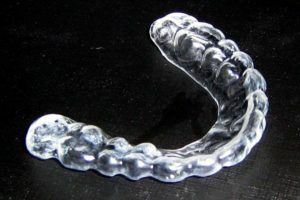 Today’s mouth guards are much less noticeable than years gone by, ask your dentist about a custom-fitted guard. If this isn’t an option, look for one that you boil-and-bite to make it, it’s more fitted for your mouth. A mouth guard is a good investment, which will make you feel even more confident on your bike. While we’re pretty sure you don’t want to think about knocking out or chipping a tooth if you have a bike crash, it can happen. These simple tips on saving your teeth, the need for speed in getting to your dentist, and ways to protect your mouth will help your dental health go a long way!